As a Yii developer I love to explore the framework related books,blog posts.Recently PacktPub published a cookbook on Yii written by Alexander Makarov. 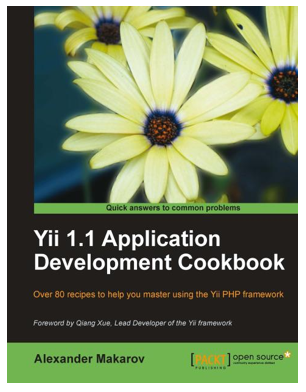 One of the best feature of Yii framework that you can develop applications really fast.The cookbook started with the chapter “Under The Hood”,beside rapid development its must to know the internal structure for maintaining good quality code.Alex tried to focus most common needs of a PHP programmer,like other frameworks you can write magic methods in Yii.In the first chapter he demonstrated that with getter,setter and event,components of Yii.Also wrote simple core method name by using which you can play with request response object. In second,third chapter author worte abut how MVC pattern works in Yii with jquery based ajax implementation.Working with JSON is an interesting section where I learned how to handle JSON inside Yii.For REST Api based application the JSON tutorial will help a lot any Yii developer. In third,fourth chapter he covered Yii form and testing.Common use cases like file uploading and captcha validation examples. Chapter 6 is important in terms of application development,in the chapter how active recored pattern works,how to write and design models for db.But truly I expected ORM implementation in this chapter(like Doctrine or Propel).Highlighting code with Yii seems to be a not relevant example for this chapter in my opinion. Rather than this tricks example,data model and Yii data handling internal architecture can help a developer a lot. Zii is a wonderful tool for handling data and make automated CRUD based basic application.I found this chapter really helpful because of writer tried to explain Under the hood of Zii,how all the classes are working.How to use grid and list view,this should help any developer.Custom grid implementation is a nice step by step example to customization Zii based code.Chapter 8,9 seems to be a well described chapters with some handy techniques for Yii core contribution and debugging.Other chapters seems interresting for advanced Yii developers,I personally liked chapter 12 as its described to add External classes,framework’s code into Yii application.Specially Zend Framework using Yii section is an exclusive section for any developer because following the steps you can easily migrate any other frameworks code to your Yii application and just use it. Nice review. I have not read the book, but have been working with Yii for over a year. We have been working on a new open source CRM project that is written in PHP utilizing JQuery, Yii, and RedBeanPHP and relies heavily on test driven development. It might be one of the most complex projects on Yii to date. Might be interesting for you. Found the live demo of the CRM interesting,hopefully I will use it in my future projects.